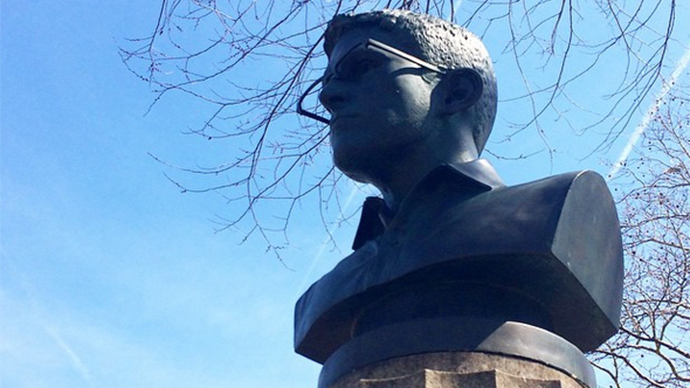 New York City Parks workers have covered up a statue of National Security Agency leaker Edward Snowden that was secretly installed overnight. The 100-lb bust was erected in Brooklyns Fort Greene Park, atop the Prison Ship Martyrs Monument. 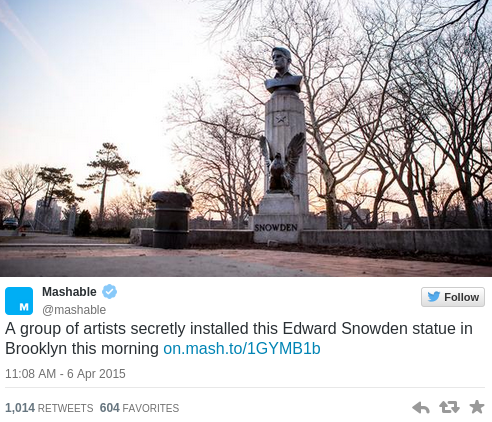 The 4-foot tall Snowden bust was fused to the monument overnight on Monday by a trio of anonymous artists and a few helpers, Animal New York reported. They renamed the tribute Prison Ship Martyrs Monument 2.0. Fort Greenes Prison Ship Martyrs Monument is a memorial to American POWs who lost their lives during the Revolutionary War. We have updated this monument to highlight those who sacrifice their safety in the fight against modern-day tyrannies, the group wrote in a statement. It would be a dishonor to those memorialized here to not laud those who protect the ideals they fought for, as Edward Snowden has by bringing the NSAs 4th-Amendment-violating surveillance programs to light. Our goal is to bring a renewed vitality to the space and prompt even more visitors to ponder the sacrifices made for their freedoms. We hope this inspires them to reflect upon the responsibility we all bear to ensure our liberties exist long into the future. Most passersby didnt notice Snowdens head atop one of the four columns that lie at the monuments edge, Bucky Turco, who exclusively documented the installation, reported. In fact, over a dozen people walking their dogs passed by the new bust on Monday morning without noticing the unsanctioned piece, Turco wrote. Both the color and design of the bust expertly matches the existing sculptures there, from its bronze patina finish to Snowdens hair which mimics the texture of the feather on the eagle. The artists also added letters spelling out Snowdens name in an official-looking font befitting of a monument. The artists told Turco that they debated how to bind the bust to its base, eventually deciding on an adhesive that would firmly hold the head in place, yet could be removed without damaging Martyrs Monument 1.0. The idea for the sculpture was conceived about a year ago by two New York City-based artists with a history of pulling off notable public interventions. Theres a media landscape that has painted him as a criminal, said one of the two New York artists.You need something theatrical and large to counterbalance the Fox News-iness of the texture of the conversation out there. They then commissioned a sympathetic West Coast artist, who took six months to create the bust, which cost thousands of dollars and had to be shipped across the country. The amount of work that goes into this kind of stuff, its easily a 30 grand [$30,000] project, said the 30-something sculptor. If it were bronze, it could be a $100,000 piece of artwork, maybe more. The artists debated several locations, but decided on Fort Greene because they believed it offered them the best chance to convey the ideals that Snowdens revelations are all about. The Prison Ship Martyrs Monument honors the 11,500 prisoners who died after Revolutionary troops retreated during the Battle of Long Island. It gives the whole thing so much more meaning, they told Mashable. Its not just about Snowden. Its about the ideals that he was trying to work towards and push others to care about. The POWs the memorial is dedicated to were fighting for the same ideals that Snowden is fighting for, they added. 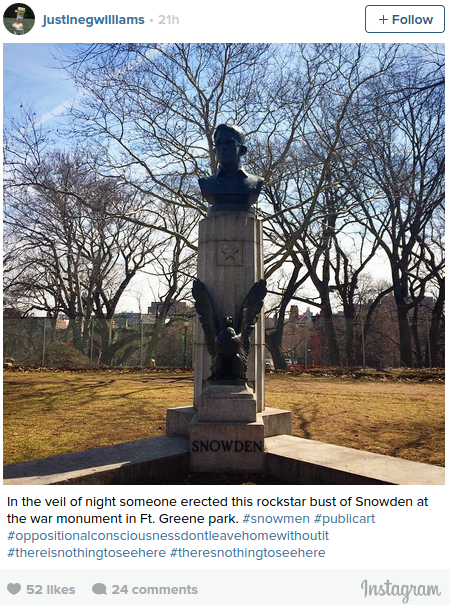 The New York City Parks Service removed the Snowden sign from the monument at 11:45 a.m. ET, Mashable reported. 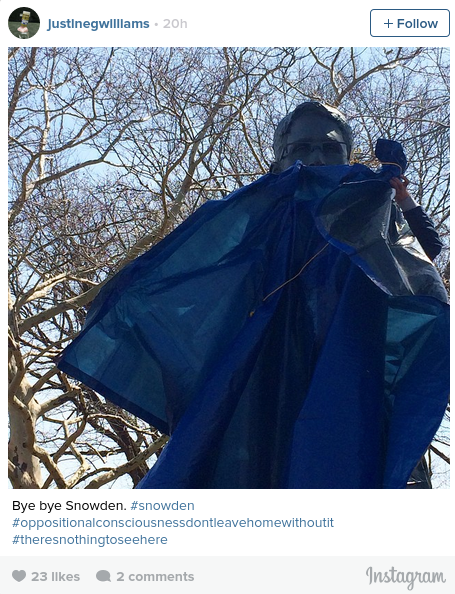 They covered up the bust with a blue tarp just after noon on Monday. One of the participants told Mediaite the group would be disappointed if the bust was taken down right away. But the fact that a risk was taken, the fact that image comes out of that event that can be passed around, can never be undone, the artist said. You can rip the statue out, but you cant erase the fact that it happened and that people are sharing it.